When I was on study leave during high school, I would have a little lunchtime tradition for spurring me on/consoling my efforts/congratulating me on a good exam (delete as appropriate). I’d walk up to our local shop in the village to purchase a packet of chicken supernoodles (classy) and a pink doughnut from the bakery display right at the front of the store. Filled with all sorts of creations, throughout my childhood i would choose between the fat, thickly-iced cupcakes half dipped in sprinkles with a solitary smartie on the other side, empire biscuits with sparkling jelly sweets and my sister’s favourite, the mallow cone. But when it came to my teenage years, I would always go for a pink dough-ring to accompany my super healthy lunch, normally consumed ignoring my history notes and watching awful wedding shows on the obscure sky channels. I have to admit there is always the temptation to purchase one when I go back home, stuffed into a paper bag, the icing sticking to the paper. Eaten on the sofa accompanied by a coffee, luckily without any school notes to ignore. The only doughnuts available around these parts are those mass produced versions in neat rounds with perfect sprinkles, stuffed with sickly sweet jam or the tiny ones sold in plastic boxes in volumes of 15. Sometimes you just want a bite of nostalgia. So naturally, I turned to the kitchen. I’ve been desperate to try homemade doughnuts for months, but have been rather put off by a lot of sources. One of my baking books (intended for the home baker) announces one shouldn’t bother if they don’t own a temperature regulated deep fat fryer. Others stick to baked doughnuts which are more cake-like their slightly-crisp fried counterparts. But despite the off-putting posts and books, I was keen to give it a go and thus my interpretation of my study leave doughnut was born. 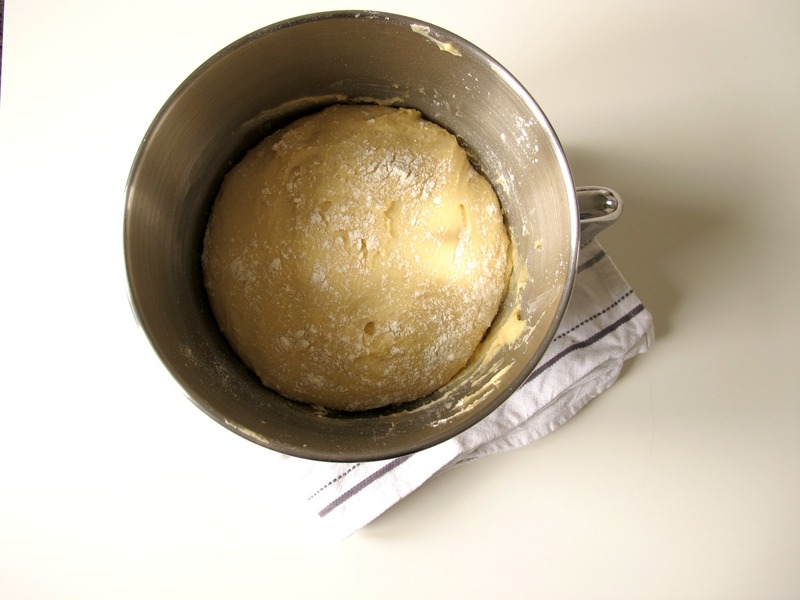 I won’t lie, fried doughnuts aren’t the most therapeutic of baking projects – if you need to whack the heck out of a dough then choose a bread rather than this enriched one, as it is very delicate and sticky. But after all the proving, frying and dipping in glaze, they are picture perfect even if they are a bit knobbly, squint and lopsided. But I think that’s what I love about them – you couldn’t just pick up one of these doughnuts in a supermarket. They may not be uniform, but they are born from my nostalgic memories of those study leave lunches and to me, that’s what makes them perfect. 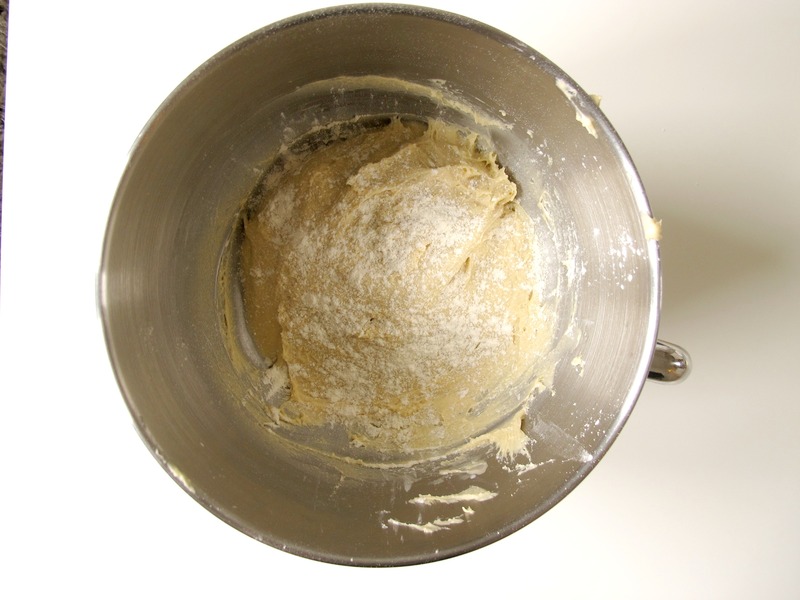 In a bowl, whisk together the yeast and the water and leave for five minutes until the mixture is foamy and bubbling. 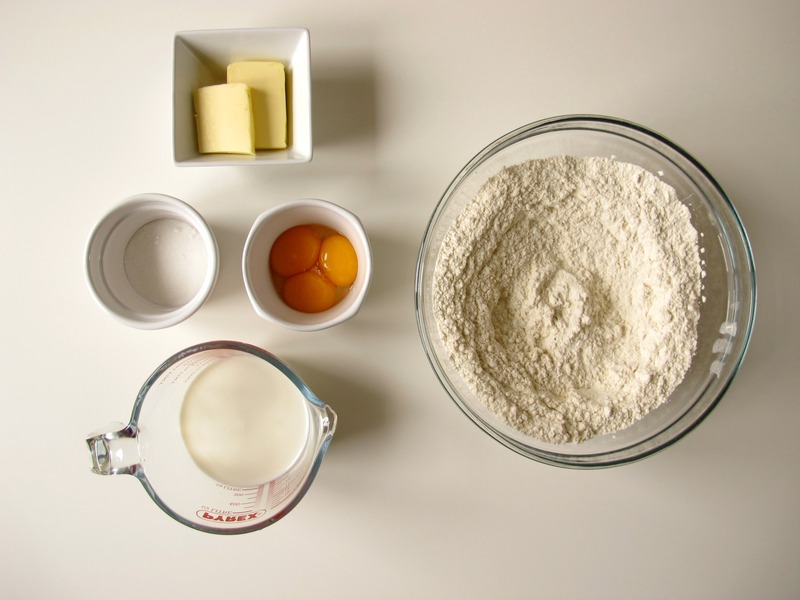 In the bowl of a stand mixer fixed with the dough hook attachment, add the flour, yolks, butter, milk, sugar, salt and vanilla if using, and mix on low speed until combined, then up the speed to medium high for three minutes. Stop the machine and scrap down to ensure it’s all combined, then sprinkle with flour to prevent a crust from forming then cover the bowl with a clean tea towel and place in a warm environment to prove for 1 ½ to 2 hours – I placed mine next to the boiler. 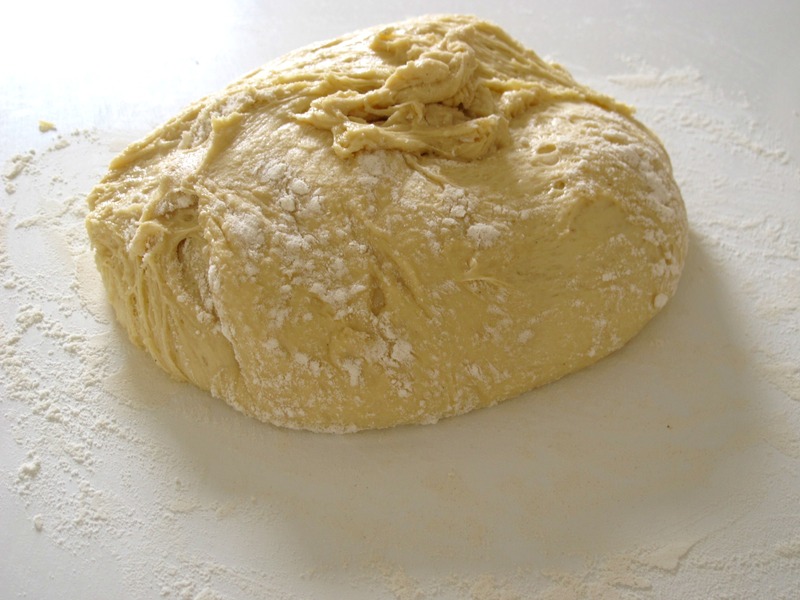 Once proved and doubled in size, carefully empty the dough onto a clean, well floured work surface and roll to ½ inch thickness with a floured rolling pin. Using round cutters around 2-3 inches wide, cut around nine circles from the dough and using a small 1 inch cutter or bottle top, cut out holes from the middle of the doughnuts. Don’t re-roll scraps. 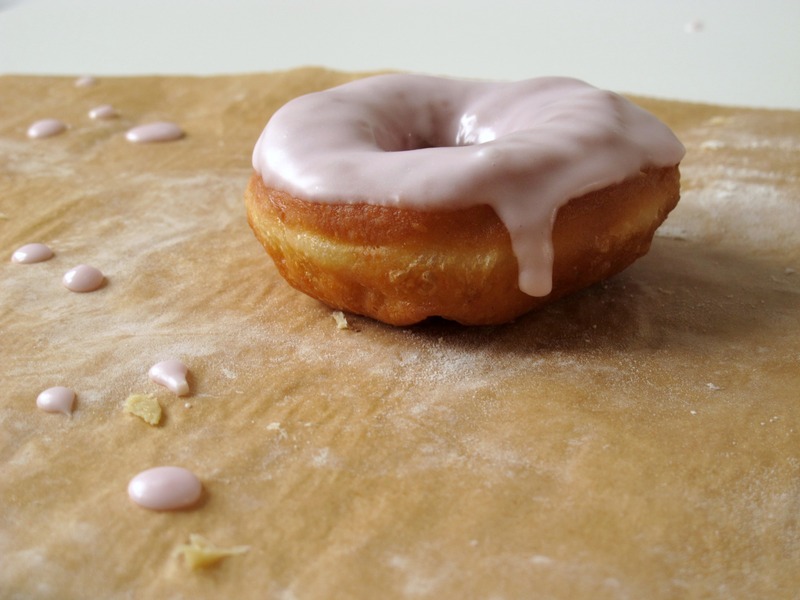 Line a baking sheet with baking parchment and spread with an even layer of flour then carefully place the doughnuts on the sheet, adding the doughnut holes to be used as testers. Cover with the tea towel and leave to prove for a further 30 minutes. Once the doughnuts have puffed up slightly, fill a heavy bottomed pan with vegetable oil and heat to 180oc on a sugar or digital thermometer. 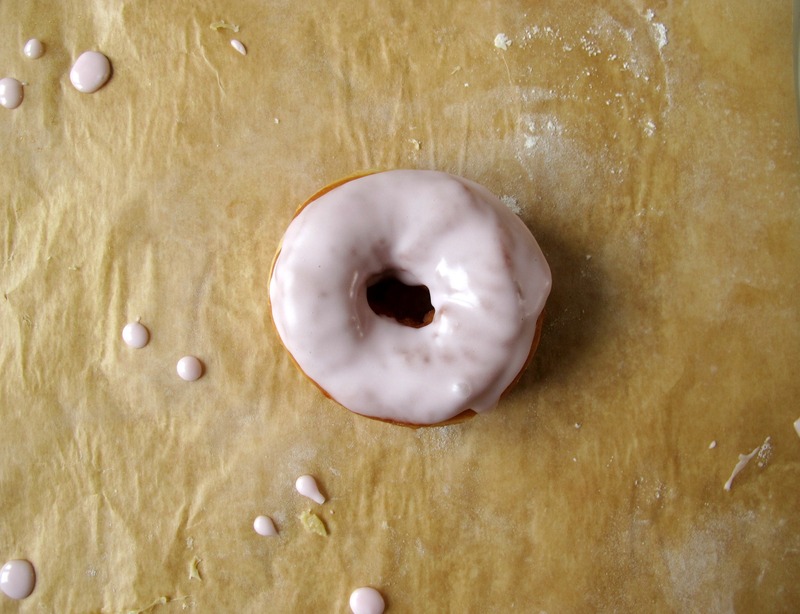 Carefully remove a doughnut hole from the sheet and place in the oil, cooking for one minute on either side. Remove from the pan once cooked and drain on a plate covered with paper towels. It should be golden and cooked inside. Repeat with the remaining doughnut holes, keeping an eye on the temperature before cooking the doughnuts. Start with one doughnut to gauge the speed they cook and aim to fry for two minutes on either side, using a timer to guide you. If the doughnuts are cooking too quickly, take the pan off the heat and continue frying – the oil should come down in temperature slightly but keep using your thermometer to check. Once golden either side, remove each doughnut using a fish slice and drain on paper towels before transferring to a paper towel lined wire rack to cool completely. Repeat until all the doughnuts have been fried. 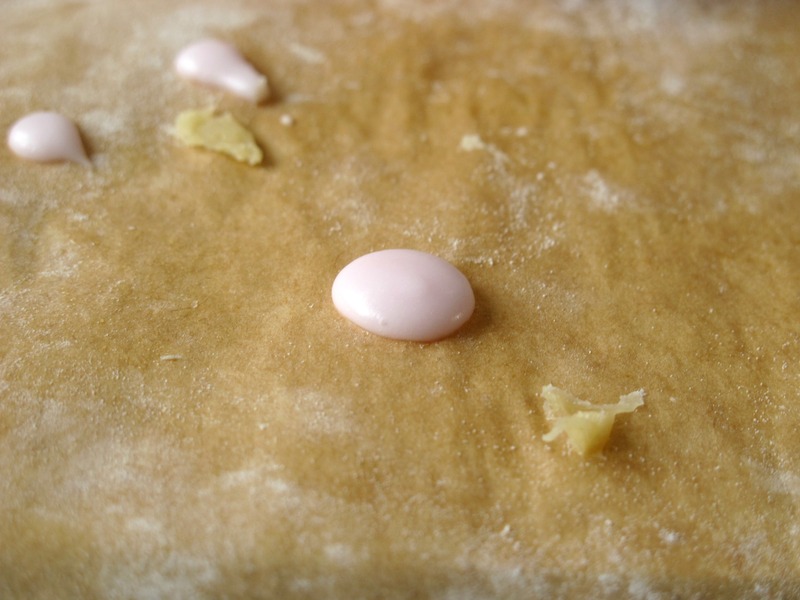 To make the glaze, whisk together the icing sugar and the boiling water to a paste, adding a little more water if necessary to make it smooth but not too runny. Add the flavouring and the colouring – I went for baby pink which was around three drops, but if you want a deeper colour add a few more. 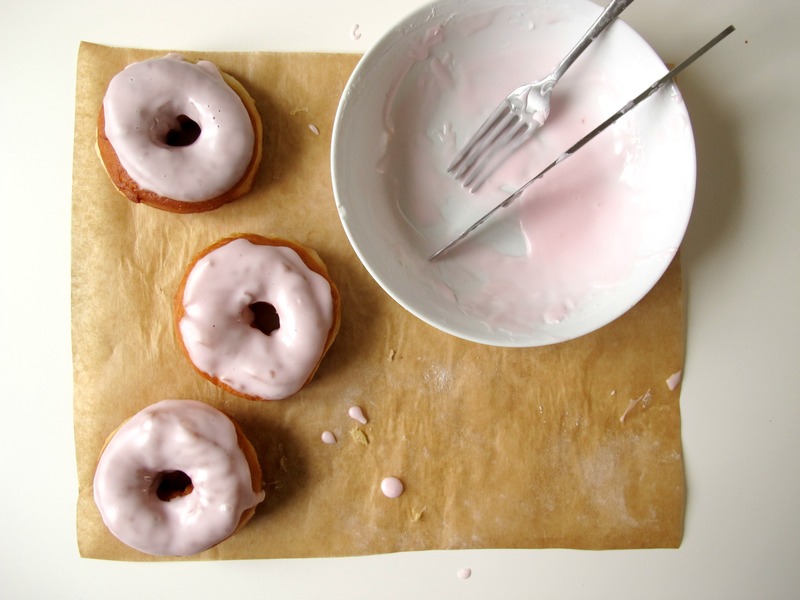 Chose the best side of each doughnut and dip in the icing, carefully twisting and letting the excess drip off before leaving to dry on the wire rack. Once the iced doughnuts have dried, serve with coffee. They are best eaten the day they are made. Doughnuts are my favourite thing in the world. I literally can’t handle myself around them.. these look so good I’m practically eating my screen. I am 100% with you on that one! If it’s not fried, it is not a doughnut.